I greatly enjoyed the first two episodes of Batman: The Enemy Within, but was left curious about the grander story as there wasn’t even a main antagonist at that point. 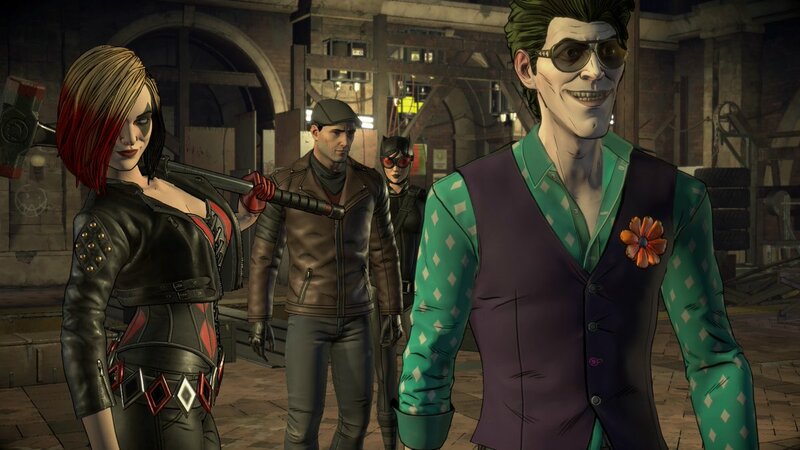 Almost on cue, Telltale Games responds by introducing a dangerous shadow organization in the latest episode, Fractured Mask. There’s still more questions than answers regarding what’s going on, but the stakes have definitely been raised. Fractured Mask picks up where the second episode ended, which was with the reintroduction of Catwoman, Selina Kyle. Her will-they-won’t-they relationship with Bruce Wayne was easily one of my favorite parts of the first season, so I was ecstatic to see her return. Laura Bailey does a phenomenal job of voicing the character, and the back-and-forth with Troy Baker’s Batman is just as fun as it was the first time around. There’s a ton of playful flirting in the episode, and should the player choose to go down the route of showing off Batman’s softer side, some more serious conversations that deal with the baggage of the first season. These moments show a different side of Kyle, one that she often attempts to hide, so they wind up being some of the most interesting parts of the episode. It’s up to the player if they want to pursue an actual relationship with Catwoman, and as a hopeless romantic, I couldn’t help but be won over by the thief. The main plot-line of Bruce Wayne being undercover as a criminal also continues here, as he’s sent on a mission to break into Riddler’s lair with Catwoman and John Doe. Seeing the contrasting attitudes of the two criminals is a real treat, as Catwoman’s professionalism doesn’t quite gel with the eccentricities of John. Regardless, the job manages to get done despite some bumps along the way. Since Riddler is being dealt with, it’s only natural that there are some puzzles to be solved. Sadly, I didn’t find the ones in this episode to be all that fun since any mistake was met with an instant death (poor Batman), and I had to retrace my steps. Once I realized what I was doing wrong, it was actually quite simple to figure out, but Telltale has had better puzzles in the past. While the adventure game elements aren’t knocked out of the park here, the dialogue sequences are top-notch. Some of my favorite scenes in Fractured Mask actually dealt with John Doe. 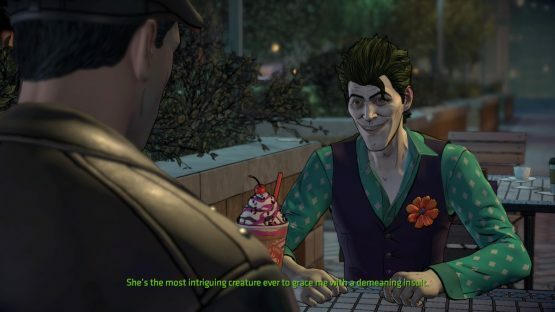 This says a lot to how well Telltale has managed to write the character, as I’ve never been traditionally a big fan of the Joker, and found him to be played out in a lot of appearances. But here, he’s not a simple maniacal villain, as he hasn’t reached that point of insanity yet, and there’s something pure to be found. It’s a really great portrayal, and one that I’m curious to see developed more. These character moments may be the strongest points of The Enemy Within, but Telltale Games has done an excellent job of making sure that the main story continues to progress. It’s this episode where the main plot really come into its own, and Batman now has a much more dangerous foe to go up against than the ragtag group of criminals he’s been hanging out with. There’s still a lot to be revealed, but it guarantees that the last two episodes will be filled with big moments. The highlight of Batman: The Enemy Within‘s third episode is definitely the interactions with Catwoman, but it also does a great job of moving the story forward. The overall picture is becoming increasingly clear, and the episode ends with a fantastic cliffhanger that left me on edge. The wait for episode four will be rough, but I’m excited to get out of this mess that Bruce Wayne finds himself in. Batman The Enemy Within Episode 3 review code provided by publisher. Version 1.04 reviewed on PlayStation 4 Pro. For more information on scoring, please read our Review Policy.